The Quadrantid meteor shower is tonight. Viewing the show is a bit tricky, but well worth the effort. Here’s how, when, and why to watch the meteor shower—and what a mysterious “disappeared constellation” has to do with it all. 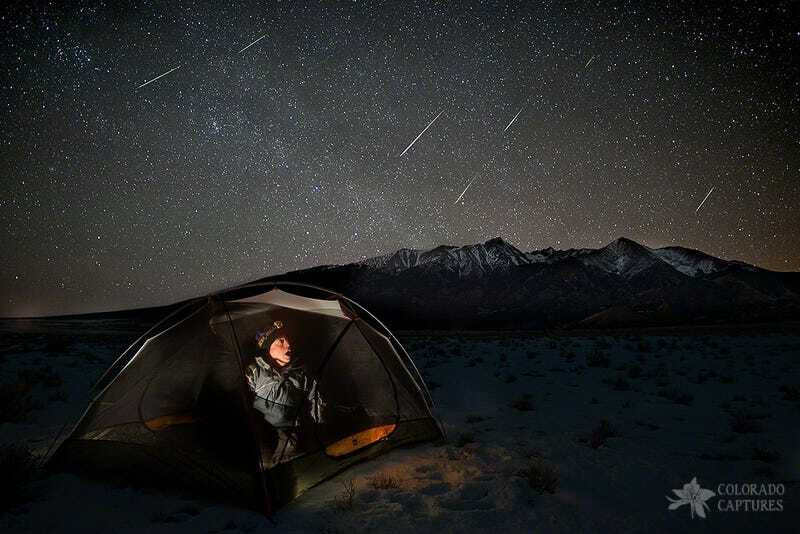 The Quadrantids are the first meteor shower of the year. Somewhat unusually, they are not the result of debris from an ordinary comet burning up in the atmosphere. Instead, the interstellar debris that we see as a meteor shower comes from a mysterious and relatively newly-discovered object, 2003 EHI. Variously described as both a minor planet, a dead comet, or an asteroid, the existence of 2003 EHI was first theorized in 1997, but it wasn’t until 2003 on Christmas Eve that astronomers were finally able to confirm it by catching a glimpse. It’s pieces of this rocky-body that you see burning up as meteors. Like last month’s Geminids (whose source was a rocket comet), this unusual source also means a couple things for how you see the meteors. They are a little sturdier than your standard meteoroids and so are likely to burn brighter and with longer trails. There should be a good number of those meteoroids too, with NASA predicting rates of 80 meteors per hour this year at a relatively leisurely speed of 25 miles per second. That’s because, even though they can be spectacular, the Quadrantids can also be one of the hardest meteor showers of the year to spot. The problem is time. While most meteor showers have a few days worth of peak activity, the Quadrantids peak will be over in just a few short hours. If you miss the very small window, you’re out of luck until next year. The Quadrantid meteor shower starts on Sunday night, January 3rd and extends into the early morning hours of Monday morning, January 4th. NASA predicts the peak will fall just after 3 a.m. (EST) and continue right up to first light. Because of the small timeframe, you’re going to want to be a little more precise than usual. There’s no room for error. If the cold or the clouds do get you despite all your best efforts, all is not lost: You can still watch Slooh Observatory’s livefeed from the Canary Islands. What’s This About a Disappearing Constellation? If you’ve been following Sky Guide since the beginning, you’ve probably noticed a trend: Meteor showers tend to be named for the constellation that gives the shower its radiant. So why isn’t there a matching constellation for the Quadrantids’ radiant? There was—but we lost it. Our list of constellations today comes from the International Astronomical Union, which recognizes 88 official constellations. Before they started standardizing in the early 20th-century, though, the list was a lot messier and included some constellations that overlapped each other. One of these now-defunct constellations was Quadrans Muralis. Quadrans Muralis was a super-constellation composed of a combination of stars that are now part of three constellations: The Big Dipper, Bootes, and Dracos. It was cut almost 100 years ago in favor of a more distinct grouping of three individual constellations—but not before it had given its name to the meteor shower we’ll see tonight. This story was first published on January 1, 2016. It has been updated to January 3, 2016.